War memorials take many different forms ranging from simple shrines to grand epitaphs, and were erected as temporary features or were designed as permanent fixtures. Some were designed to be modern pieces of architecture to fulfil their object of design but others followed traditional practices of memorial. An example of the latter is the use of stained glass windows and the church. These memorials are often full of religious iconography and are dedicated to individual soldiers, such as in St John’s Parish Church (Goole), or are dedicated to the fallen of the congregation and local population. The dedication of shrines and memorials within the church is in itself a complex theological idea, with ranging beliefs between the Catholic and Protestant spans of the Christian Church. The dedication of shrines within the Wesleyan (Protestant) Church can therefore be considered unusual. 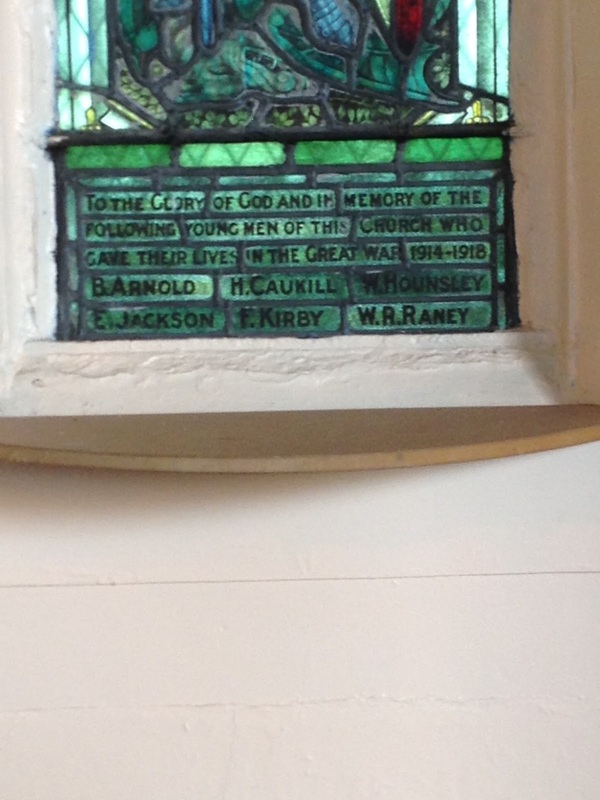 Yet within the Methodist Churches in Goole memorials were erected to the serving men and women of their congregation. On the first plaque are listed – “W. Silvester, H. Simms, G. Snead, F. Thurston, E.Vause and J. Vause”. On the second plaque are listed – “B. Arnold, H. Caukill, W. Hounsley, E. Jackson, F. Kirby and W.R. Raney”. 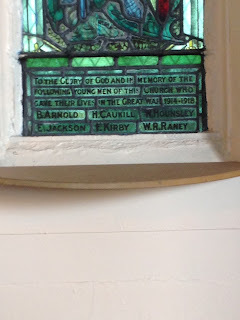 The permanent memorial replaced an earlier Roll of Honour erected in the church during 1917. 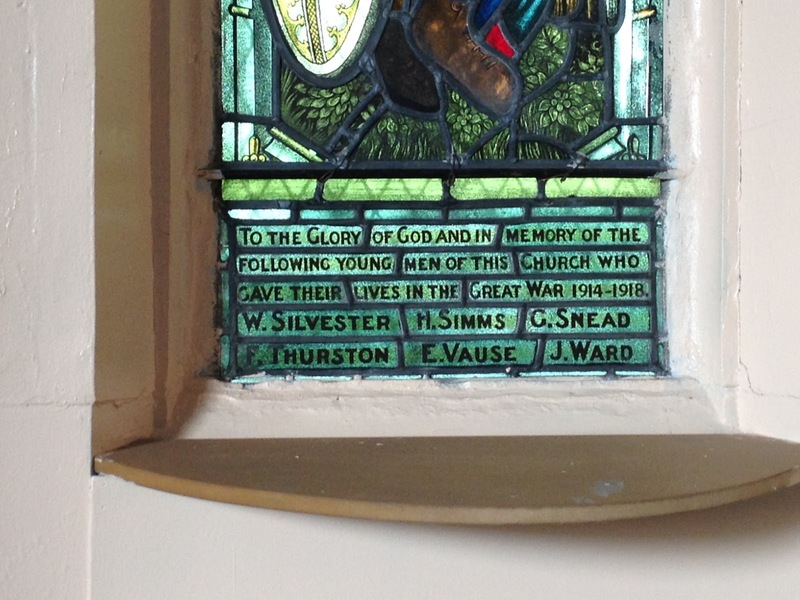 The 1917 memorial was dedicated to all those serving from the Church in the armed forces but has since been lost. The Roll of Honour was dedicated during a service during late October 1917. The memorial, made by a Mr H E Chambers, is described as ‘handsomely designed’ and ‘well executed Roll of Honour’, consisting of a handsome oak frame, with rich gold beading. Only those connected with the church immediately before the war were included on the roll. 46 members of the church were listed and of those six were marked with a long gilt cross to mark the giving of their lives. E. Arnold, L. Butler, Campbell, A Davidson, H. Diamond, H. Dixon, F. Evans, P Flowers, T Gale, T Green, A Heunsley, C Hobson, W Jackson, P Joyner, OW Kelsey, G N Lidguard, P Lundy, I Mellor, A Phillipson, E Phillipson, W Ramsbottom, A R Raney, G. Rushby, F Schofield, H Simms, H Sinclair, G Snead, R Snead, R Sykes, A.Vause, W Vause, H Ward, T Ward, S Weatherill, F Wilson, G Yeoman, J Yeoman. Out of the 46 men listed on the 1917 Roll of Honour ten were killed whilst serving in the armed forces and a further two men joining the armed services during the last year of the war would lose their lives. 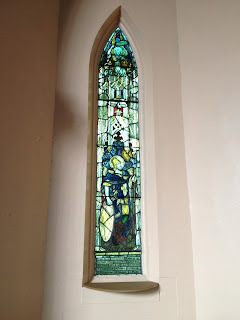 The erection of shrines within the Methodist church is unusual but the memorials and shrines placed within the Trinity Methodist Church demonstrate the popular demand for remembrance during the war and in the years following. Wahooart.com, the site that sells good canvas prints to order from their database of digital images, has many Rothko prints. I ordered this one, Blue and grey, http://EN.WahooArt.com/A55A04/w.nsf/OPRA/BRUE-8BWU7F, that I have now hanging in my study. I can spend a long time looking at this elusive image that takes me to some other place not in this world.